I always was a fussy eater as a kid and my mother didn’t know how to make me eat vegetables. Surprisingly I loved brussels sprouts. That was quite unusual as children are not big fan of these little green vegetables. 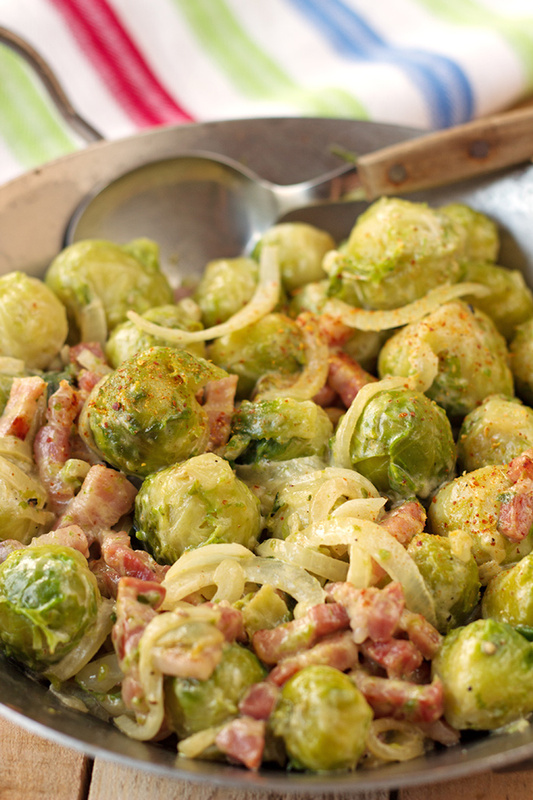 But who can resist… The bitterness of brussels sprouts disappears thanks to smoked bacon and onions. Fried onions and thick cream sweeten the taste of the recipe even more and you can add some pepper and Espelette pepper to enhance flavour. Simply serve as a signature side or as main course. I served it with a roasted guinea fowl. But you can associate these brussels sprouts with any kind of poultry. I like also brussels sprouts together with wild game and roasted chestnuts. This will be then the perfect recipe for next autumn. 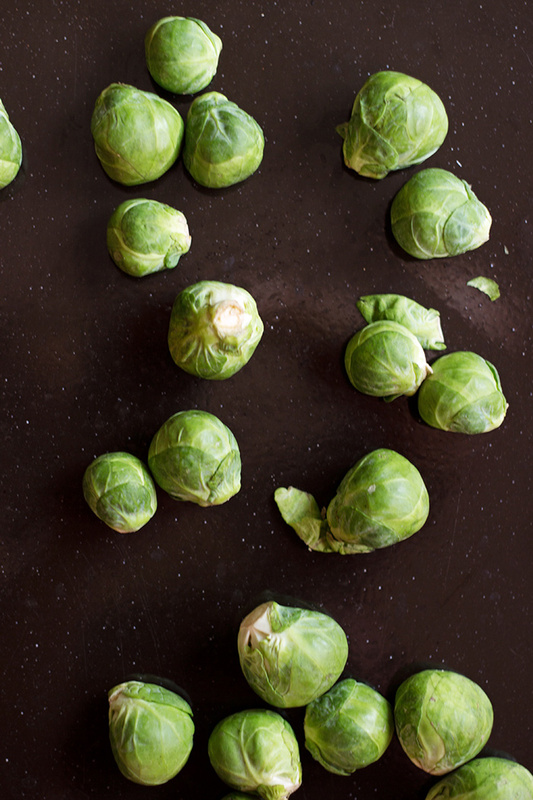 Adrien didn’t like brussels sprouts until he tried this recipe few weeks ago. He told me that of course together with onions and bacon, it tasted wonderful. Bring some water to a boil with one teaspoon of salt. 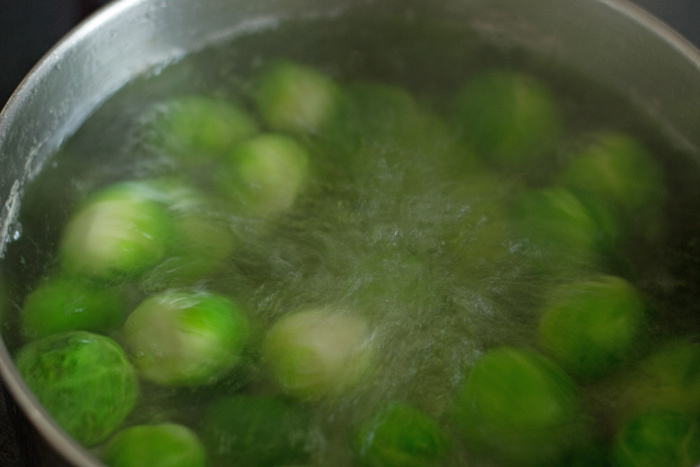 Wash brussels sprouts with fresh cold water removing any dirt or dust. Remove outer leaves that do have blemishes. Put brussels sprouts into boiling water for 10 minutes. Sieve and reserve. Brown onions. smoked bacon cubes and brussels sprouts for few minutes. Add heavy cream and pepper, leave to cook a bit more monitoring cooking process and serve immediately. Thank you very much for reading. Register to the newsletter or follow me on social media to receive the latest recipes. Thank you Lisa. They were :-)! 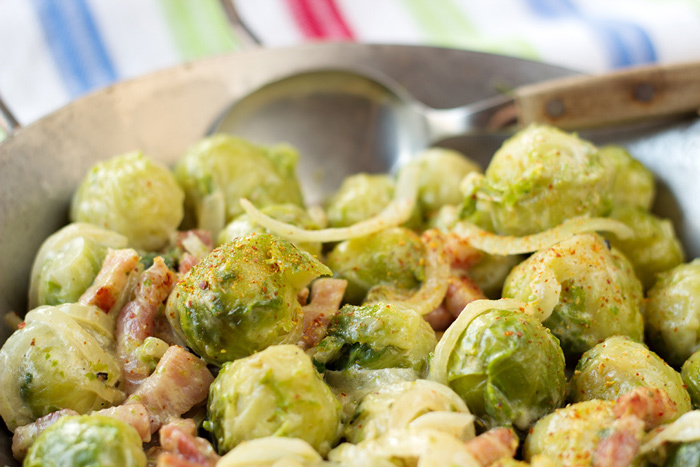 The combination of brussels sprouts and bacon is such a classic.. that I can imagine how good this must have tasted! Thank you very much Thalia. Brussels sprouts, I think, are my favorite vegetable. I usually just add olive oil or browned butter. But I’ve never thought to add cream. How exquisite! I love them with onions, bacon and cream. But I will try to do it your way and see if Adrien likes it. It would be healtier :-)! 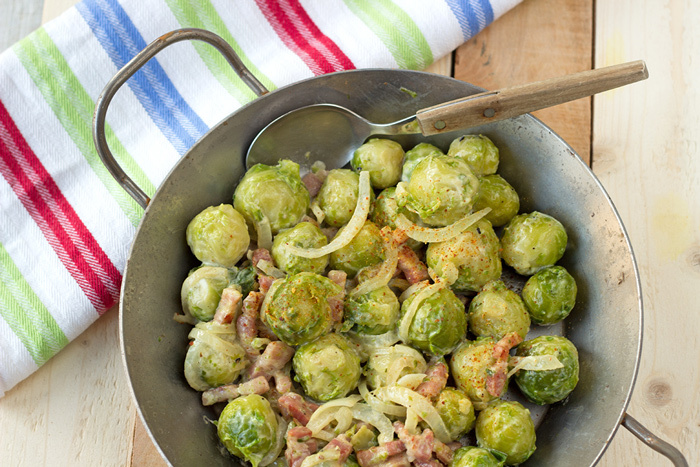 I love brussels sprouts with smoked bacon, but never combined it with onions, so I will try this out soon. I bet it taste delicious! It tasted great! Definitely a must try. Thanks Bridget.